Daniel Yee is a senior industrial designer at LPK, overseeing design and brand direction for diverse product-development initiatives. Fascinated by the convergence of trends, foresight and industry meta-narratives, Yee takes a decidedly collaborative and future-focused approach to design pursuits, traversing categories like automotive, transportation, medical, consumer electronics and education. 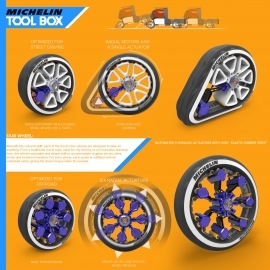 He currently has several products in market, from medical equipment to airplane interiors. 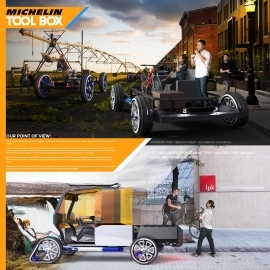 During his tenure at LPK, he has won several awards, including honors from MIT Media Lab for his work in patient-care continuum, and the Valtra Design Challenge, an international call to develop the tractor of the future, engineered for a changing climate and modernized agricultural culture. Yee is an alumnus of the Cleveland Institute of Art’s industrial-design program, where he studied automotive interior and product design. He lives and works in Cincinnati, Ohio. 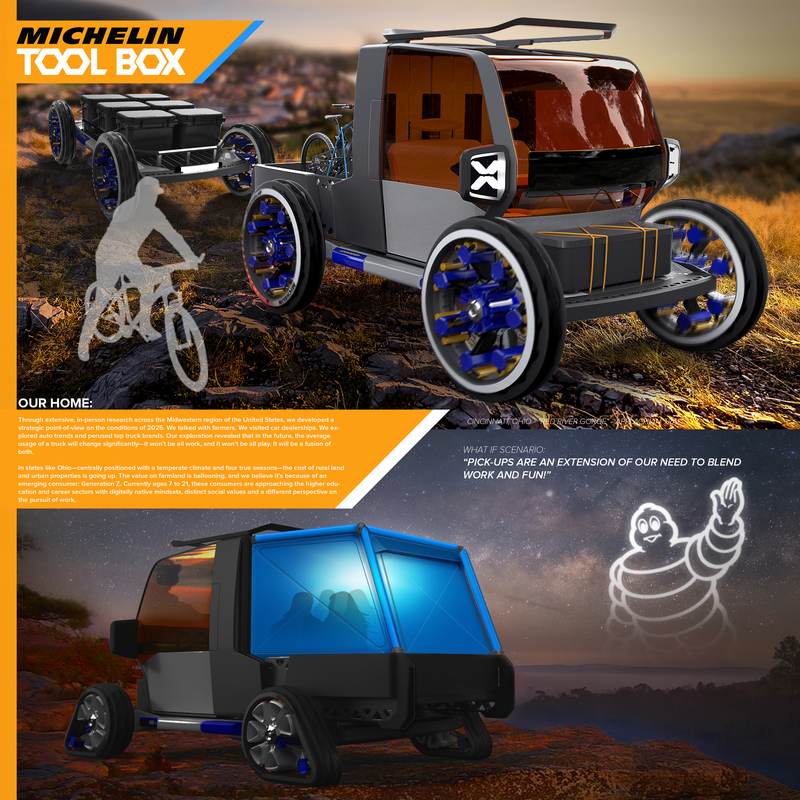 Paul Olvera is an adjunct professor at University of Cincinnati’s College of Design, Architecture, Art, and Planning (DAAP), where he teaches transportation-design communication, emphasizing the critical connection between analog sketching and VR 3D modeling. 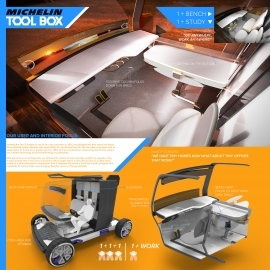 For the Michelin Challenge Design, Olvera assisted with concept and narrative development, as well as sketch ideation and algorithmic 3D modeling for both exteriors and interiors. Olvera was born on the southwest side of Chicago. He graduated from DAAP with a degree in industrial design, a specialization in transportation design and a minor in marketing. In 2016, he won the IDSA Student Merit Award and was voted “2nd Best from the Americas” by CarDesignNews for his senior capstone project. Claire Keys Pytlik is a copy director, overseeing content strategy, brand voice and global storytelling for LPK. In addition, she lends her expertise in brand strategy and verbal expression to brands. In her career, Keys Pytlik has developed and managed voices for a diverse roster of businesses – from global players like Michael Kors, NASDAQ and Cargill to boutique brands and nimble startups. She’s also published features on style, fashion, travel and the arts for various magazines and created verbal installations for exhibition. Keys Pytlik attended Miami University in Oxford, Ohio, earning degrees in English, creative writing, contemporary poetry and sociological theory. She later studied book and magazine publishing at NYU. Marcus Hamilton is an industrial designer at LPK. With a focus on visual design expression, Hamilton has lent his expertise to a broad array of categories, developing innovative, solutions-driven designs for brands like Tervis and Gillette. Born and raised in Ohio, Hamilton holds a degree in industrial design from the Columbus College of Art & Design. 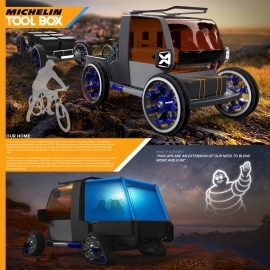 His list of awards includes the Gold Spark Award for his CAD work on Airstream in 2014, and most recently, his contributions to LPKÕs win in the 2017 Valtra Design Challenge. T.J. Cianciolo is a senior designer at LPK who brings a unique synthesis of specializations to his design pursuits. 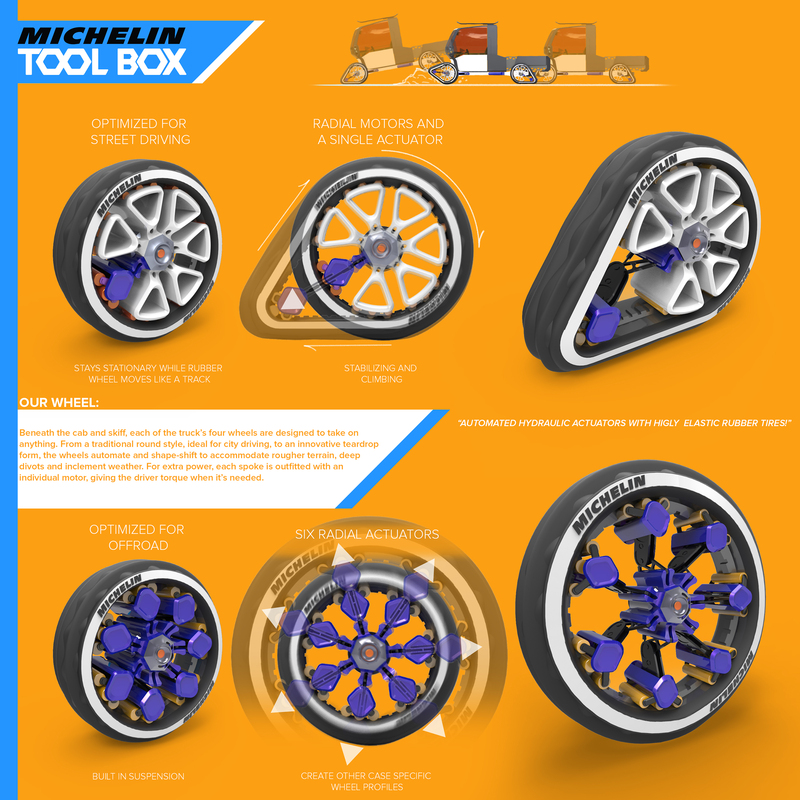 In addition to product design and VR applications, Cianciolo focuses on 3D renderings, animations and motion graphics. A proud multidisciplinarian, he has worked with clients like Olay and Old Spice, Pringles and Febreze. Cianciolo holds a BFA degree in industrial design from Kendall College of Art & Design. His work has garnered industry attention, including awards from ADDY and Graphis. Off the clock, you’ll find him with his black lab, Bowser. LPK is a global brand strategy and innovation consultancy, obsessed with solving life’s problems, big and small, through thoughtful design. There’s a famous quote by Henry Ford that distills our approach. Reflecting on his invention, the automobile, Ford said: “If I had asked people what they wanted, they would have said faster horses.” Innovation marries what could be and what is – what consumers desire and what is needed – resulting in the intuitive products and technologies that push us forward. At LPK, we believe that innovation is an essential and powerful dimension of the modern brand. Our team merges diverse disciplines and three decades of experience to design offerings that are at once aspirational and accessible, innovative and wholly useful. We’ve done it for brands across CPG, outdoor, military, home care and more. Our products, systems and services have garnered industry attention and numerous awards, including honors from IDEA, Valtra and Red Dot. 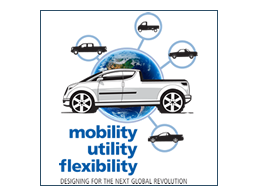 What does the truck of 2025 look like? For us, the question was impossible to answer without first asking another: what does work look like in 2025? Through extensive, in-person research across the Midwestern region of the United States, we developed a strategic point-of-view on the conditions of 2025. We talked with farmers. We visited car dealerships. We explored auto trends and perused top truck brands. 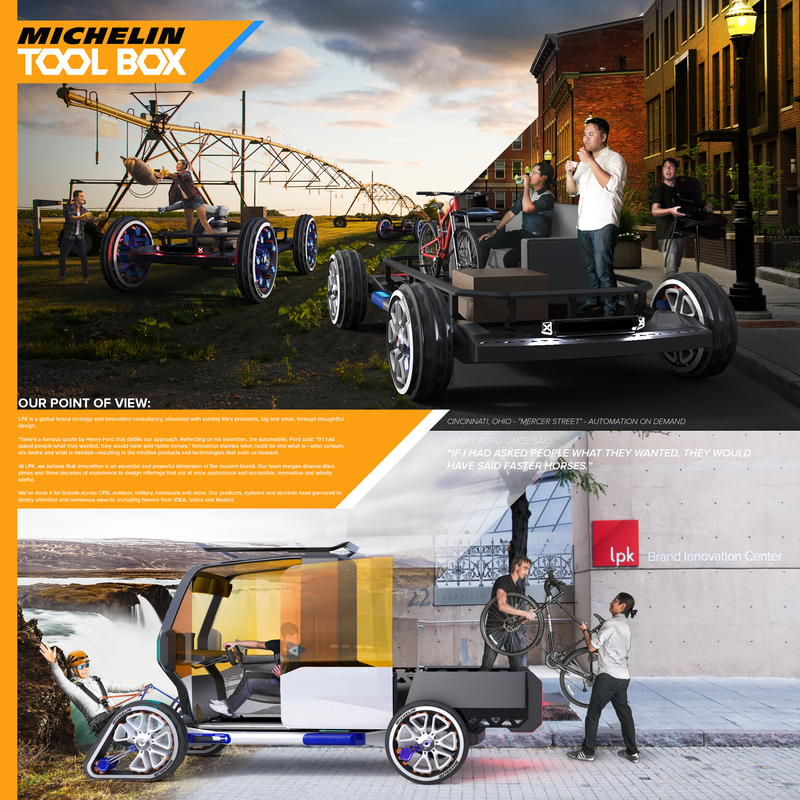 Our exploration revealed that in the future, the average usage of a truck will change significantly – it won’t be all work, and it won’t be all play. It will be a fusion of both. In states like Ohio – centrally positioned with a temperate climate and four true seasons – the cost of rural land and urban properties is going up. The value on farmland is ballooning, and we believe it’s because of an emerging consumer: Generation Z. Currently ages 7 to 21, these consumers are approaching the higher education and career sectors with digitally native mindsets, distinct social values and a different perspective on the pursuit of work. Knowing the Gen-Z shopper is one of our core consumers in 2025, we designed into their wants and needs. We envisioned young urbanites with equal affinity for city life and farm life. We saw super consumers with an appreciation for luxury, but a greater want for utility. And we recognized an unwavering demand for automation, intuitive technology and forward-thinking accouterments. With Gen-Zers as our protagonists, we reframed the notions of work and play wouldn’t be separate – they would converge into a new norm. Consumers will no longer opt for a new pick-up truck as a shiny status symbol or a heavy-duty piece of equipment. Gen-Z shoppers will pursue a truck that is both, designed with modularity for various tasks, ever-changing lifestyles and an on-the-go mentality. Our truck is revolutionary in its silhouette, flexibility, technology and finishing. Built as two separate but fusible parts – a cab, essentially designed as a tall, cube-like car, and a skiff, approximately the size of a queen mattress, meant to hold a metric ton of weight. Conjoined, the two parts become the ultimate in pick-up truck performance. A large, robotic arm equips the driver with a literal extra hand, easily operated to perform tasks like loading and unloading the truck bed. Meanwhile, the cab – startlingly spacious, about 40% taller than the average cab – meets the demands of more vertical farming and pays homage to Gen-Z’s love of the drive. The open, light-filled environment has a soothing effect – like a breath of fresh air, or a long, open-road drive. Finished with sleek, minimalist finishes, it features elements like a small, convertible desk, pointing to the next iteration on tiny homes: tiny offices for on-the-road commutes. Beneath the cab and skiff, each of the truck’s four wheels are designed to take on anything. From a traditional round style, ideal for city driving, to an innovative teardrop form, the wheels automate and shape-shift to accommodate rougher terrain, deep divots and inclement weather. For extra power, each spoke is outfitted with an individual motor, giving the driver torque when it’s needed. 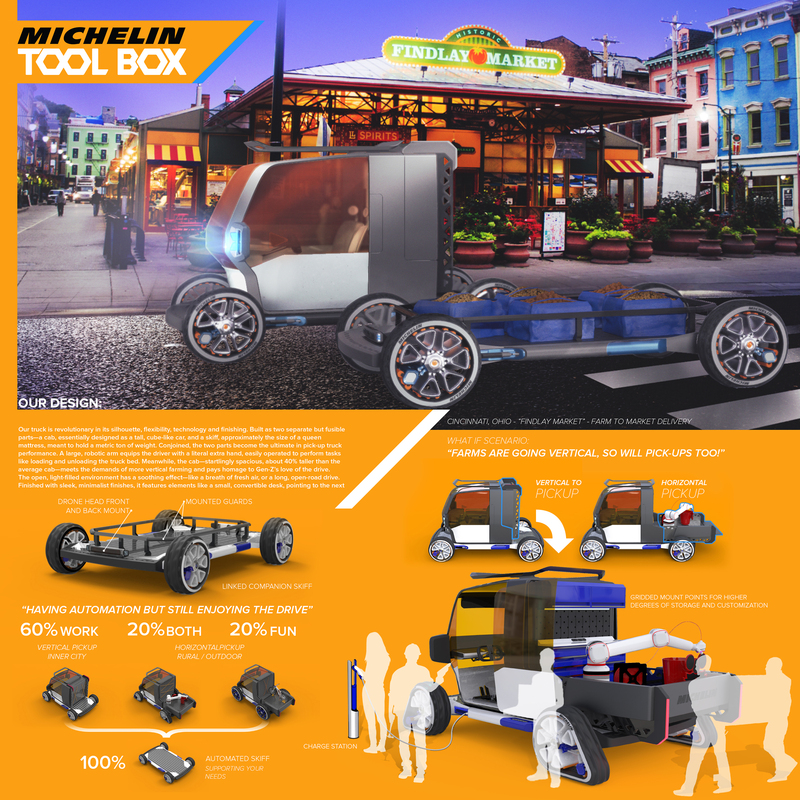 As illustrated through our series of images, the truck of 2025 is one that breaks the rulesÑan automobile that merges technology and insights to meet the needs of a new consumer class and embrace changing conditions. By focusing on people’s desires for independence, social contact and curiosity, weÕve developed an innovative and powerful piece of machinery that’s more than just capable – it’s also quite fun.